Carla Berg is trying to think like a tobacco executive. The associate professor in behavioral sciences and health education wants to borrow the sophisticated market segmentation techniques the tobacco industry has used so successfully for decades to lure smokers. Berg, however, plans to use them to identify young tobacco users and convince them to quit. "Public health professionals are not as good at marketing our product, which is health, as the tobacco industry is at marketing its products," says Berg, who is currently working toward her MBA in marketing at Emory's Goizueta Business School. "This is particularly true when we try to target youth, who believe they are going to live forever." But immortality and tobacco usage don't mix. While smoking rates have declined in the 50 years since the Surgeon General's report on the hazards of tobacco use was released, smoking remains the leading cause of preventable death in the United States. And it's not just about cigarettes anymore. A host of new products that appeal particularly to youth have arrived on the scene. Hookahs and water pipes can be enjoyed in trendy, social hookah bars. Smokeless tobacco products, such as Snus and other dissolvable strips and lozenges, don't require spitting, making them more appealing to image-conscious users. Some cigarette-sized cigars contain enticing flavorings, such as grape or strawberry. The newest arrival, e-cigarettes, come in a dizzying variety of devices, each with a plethora of flavored liquids from which to choose. "Young people who are starting to dabble in these alternative products, or even in cigarettes, generally don't even identify themselves as smokers," says Berg. "They tend to think hookahs, smokeless products, and the like are not particularly harmful. These kids and young adults are on a slippery slope, and if we could intervene in time, we might be able to stop them before they become addicted to nicotine." 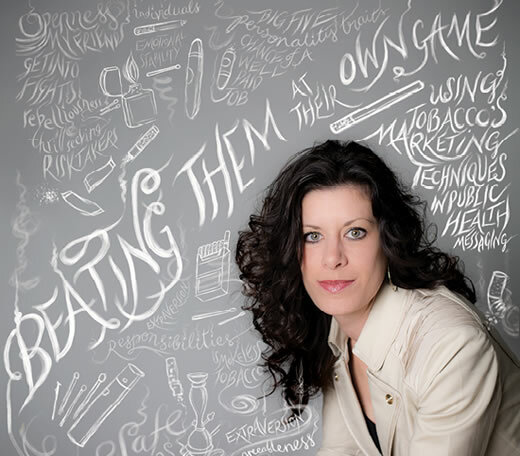 To achieve this, Berg is taking a page from the tobacco industry's book on marketing—literally. In the 1990s, many private tobacco industry documents were released to the public as a part of the Master Settlement, in which the largest U.S. tobacco companies agreed to change the way tobacco products are marketed and to pay states more than $200 billion. The consumer segmentation and marketing that tobacco companies used to lure consumers, particularly youth and young adults, were revealed. "In public health, we segment by demographics—gender, age, race, ethnicity. That's about as sophisticated as we get," says Berg. "The industry documents showed that tobacco companies segment along the lines of lifestyle characteristics—attitudes, values, who people hang out with, what kind of music and fashion people enjoy. These kinds of things get at who people really are and how they behave, which has allowed tobacco companies to create marketing and advertising that specific sets of consumers can identify with." Berg recently published a study that looked at whether the same tactics could be used to identify specific groups at elevated risk for tobacco use and, ultimately, to fashion anti-tobacco messages that would resonate with each segment.